When Will Serena and Venus Williams Be Added? Mario Tennis Aces has got to be one of the Nintendo Switch’s most consistently updated titles. Since coming out almost 10 months ago, the game has reached its 3.0 update with eleven DLC characters and a bunch of limited time events. Last month, Mario Tennis Aces saw the addition of the OG Mario damsel Pauline. Just like last month, the players who participate in the online tournament for April will be awarded this month’s new character Kamek. 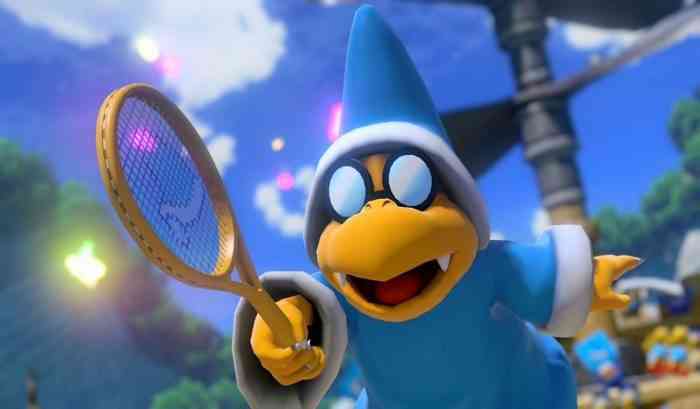 Kamek is not the only addition in this round of Mario Tennis Aces DLC. Update 3.0 is adding the game mode Ring Shot. In this mode, players work together to rally the ball through rings on the court and rack up as many points as they can in the time limit. Ring Shot can be played in Singles or Doubles, supporting up to four player co-op. A variant of Ring Shot sees the return of Yoshi’s Ring Shot. Yoshi’s Ring Shot is an event running until the 1st of June. It plays the same as regular Ring Shot, but players play as different coloured Yoshi. Extra points are awarded when players hit the ball through the coloured rings corresponding to their Yoshi colour. Adventure Mode has been gifted a new opening cinematic. Players can view this upon starting a new game or for existing games, selecting Opening (Ver. 3) under Adventure Mode’s Bonus menu. The Online Tournament has also been given a new addition. Players can now achieve the rank “Ace”. To achieve Ace Rank, players must have a rating of 5,000 or higher. Other minor changes have been made and can be viewed on Nintendo’s support site. Will you be taking part in this month’s Online Tournament? Let us know in the comments below.